Photo: A foreign shop owner stands guard inside his Alexandra spaza shop. EWN/File. 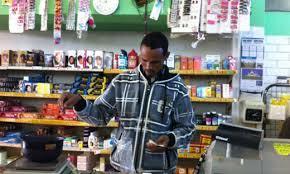 Research by Dr Sally Peberdy of the Gauteng City-Region Observatory (GCRO) shows that far from taking jobs from South Africans, more foreign shop owners in Soweto employ locals that local entrepreneurs. The research has come into the spotlight after last week’s Soweto attacks sparked by a Somali shop owner allegedly shooting a 14-year-old boy. Peberdy’s research shows that a majority of foreign nationals who are entrepreneurs are trading legally, and that if the government were to “stop” them from doing business, South Africans would suffer just as much as the foreign nationals. Speaking on 702 after questions were raised around her comments that foreign nationals should share their ideas with local business owners, Minister of Small Business Development, Lindiwe Zulu reminded South Africans that our historical background has disadvantaged a majority of “black South Africans who were left out from participating in the economy of the country”. Perdeby acknowledged that while Minister Zulu’s point is true, the questions need to be guided towards government to find what the government is doing to better equip local entrepreneurs. Contrary to the perception that foreigners are “taking over” the informal sector, Perdeby’s research found that 2 out of 10 informal business owners were South African as were nearly nine out of 10 (87%) of formal sector business owners. Minister of Small Business Development, Lindiwe Zulu has since apologised after having to be physically restrained in Parliament.